Bereditte Jastal is a Breton bookseller and author who can be found at the Thirsk Mead Hall. He has a room upstairs there, though during The Mead Hall Massacre quest, he will be found outside instead. Among his published works are Sovngarde, a Reexamination and Thirsk, a History, a book which he revises when you become the Chieftain there. Also check his wares for The Black Arrow, Volume II, a Marksman skill book. He is wearing an expensive shirt with matching pants and a pair of wolf boots. When he is outside, Bereditte also carries a bear cuirass and helmet. Aside from his natural bonus and resistance to magicka, and his ability to shield himself for short periods, he knows the spells Charisma, Great Resist Common Disease, Great Resist Fire, Great Resist Frost, and Great Resist Magicka. "Greetings, %PCName. My name is Bereditte Jastal. Perhaps you'd like to buy one of my books? I'm a bookseller by trade, but my real passion is writing. I recently finished two scholarly works, Thirsk, a History and Sovngarde, a Reexamination. I have copies of both for sale, among others." "My goodness, is everything all right downstairs? I heard screaming, and the sounds of battle! I would have gone down to investigate, but I'm much more of an observer than a participant, if you get my meaning. I'm a bookseller by trade, but my real passion is writing. The Solstheim Nords are my area of expertise, you might say. I recently finished two scholarly works -- Thirsk, a History and Sovngarde, a Reexamination. I have copies of both for sale, among others." "Hello, my lord! I have a gift for you...just a little something. I've written a revised edition of my history of Thirsk, and would like for you to have the first copy. It chronicles your valiant battle against the Udyrfrykte, and adds you to the list of chieftains. May you rule over Thirsk for years to come!" "Hello, mighty chieftain of Thirsk! The mead hall is better than ever under your leadership. I still have works to sell, if you're interested." "Oh yes, the Skaal are quite fascinating! Any study of Solstheim must include the Skaal, for they've played an integral part in shaping this island's history." "The Nords believe that the god Shor constructed a magnificent fortress where valiant Nord warriors may live forever, feasting, fighting...basically doing everything Nords like to do. The trick is finding the way in. According to legend, the entrance to Sovngarde is hidden, and only those who take up the search may ever find the way in. But according to my research, which I've chronicled in a new book, the way into Sovngarde isn't quite what they thought." "I came to Thirsk all the way from Cyrodiil, by way of Vvardenfell. 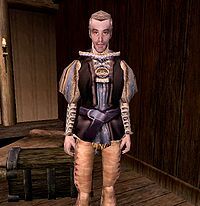 My father once visited Solstheim, you see, and as a boy I was intrigued by his exciting stories of the Nords. I was particularly fascinated with this very mead hall -- its residents and their adventures, things like that. I arrived here over a year ago, and have been living among the Nords ever since. I've been chronicling their lives, and recently collected enough data to complete my history of Thirsk." This page was last modified on 23 November 2018, at 06:13.